I decided to try pickerel fishing again with some people new to the TFF club. This section of water was new to me. We hiked down and split up at the waters edge. I figured something has to be in that tree along the left side. The bass bandit fly I tied has been pretty good to me lately. On the third cast I felt a tug and soon had my first pickerel. The fish inhaled my fly. The tricky part was trying to get the fly out of the fishes mouth with out it biting me. The fish acted very docile when I had it around the belly and side. Anytime I went near its face it went berserk. I decided to check out it's mouth to see what kind of teeth I was dealing with and if I could lip the fish. Maybe these fish aren't as nasty as people say. I had a nice lip hold on the fish when it gave a head shake, snapped my leader and gave me a nice souvenir of why pickerel should be respected. It cut my thumb with the efficiency of a scalpel. Luckily the fish was small and didn't do much damage. If the fish had been much bigger that would have been the end of my day. I worked more water but didn't have much luck so I walked the banks sight fishing. I did see two fish in habitat just as I've read. Rip rap and fallen trees right against the bank. One fish was so close I almost stood directly over it when looking in the water. This creek gets a ton of foot traffic and I wondered if the fish were used to it. I made a dump cast to the fish and first it swam away. I wasn't surprised but as I took my line out of the water I noticed it charge back. Did I really have another shot? I cast again and made a few twitches with the fly, the pickerel moved closer and closer but didn't commit. I made one last cast and this time I did a type of jerk up and down motion with the fly. The fish moved closer as the fly was falling and the instant the fly was about to touch the ground the fish engulfed it. I went to set the hook and my leader was cut instantly. I walked maybe 10ft down stream and spooked another fish. Usually with most species that is it you've lost your chance. I cast over in front of the fish and worked my way back the fish stopped swimming, swooped around and charged the fly like a barracuda. I think I've found a fish more aggressive than a bluegill and I am in love. The same action worked on this fish. A few small jerks and a dead dive to the bottom. This fish didn't commit as much as the last one. It slashed at the fly and took off. That was the last fish I saw but my friend and I worked a ton of water. A buddy fishing a different section caught a few pickerel himself but the strange thing was we saw no other fish. No bluegill, bass, carp, catfish nothing. It was really strange. A guy hiking said the creek is really good and has some big fish. It was hard to believe. Mostly because the creek has few pools deeper than 2 1/2 feet. Either way I'll be back to sight fish. It was a great day and a good sign that spring is almost here. If you've been following my blog I'm sure you know about the ponds at my work. Well this post is about a different pond. There are about 6 ponds with in 2 miles of my house. I tried one I have never fished before. Seemed like a great time to try the new flies I tied. There was a guy spin fishing and when I asked if he caught anything his answer was "not yet." The conditions did look promising. I saw some activity in the corner of the pond and there was something in the shadows I couldn't make out. The swans were giving it fits. When I walked closer I realized it was a muskrat. It looked to be eating the same thing the swans were but paying a price. There were actually two and one swan had enough and chased a muskrat out of the water. I made several casts and on my second I swore I felt a hit. I continued to work around a drain pipe and while I fiddled with my line I noticed tension. I lifted the rod and an unmistakable flash came to the surface. 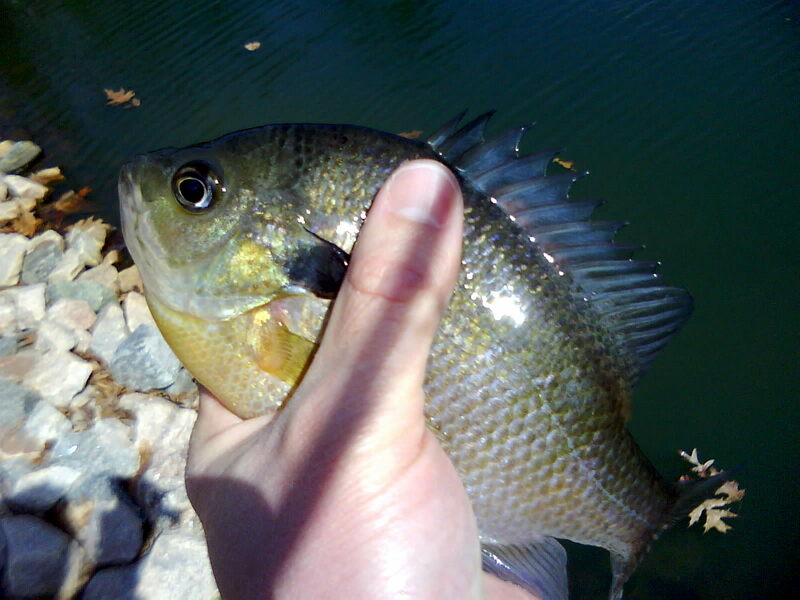 I thought it was a small bass but when I brought it to hand I saw that it was a bluegill. One of the biggest I have caught in awhile. That was my only fish but not even a stones throw was another pond. The wind had made one side of the pond a layer of leaves. Behind me was a steep hillside. It was a great casting challenge. Cast up the angle of the hill then far enough out over the leaves. With in about 5 casts I had a little bass. I was thrilled to know that my fly indeed works. The bass seemed to be stationed in the sun and sheltered from the wind. The guy who was spin casting came over and politely asked if he could join me. I told him where the fish were in a few casts he had a fish on. I had to leave to get back to work but it was a lunch well spent. I'll probably visit these ponds more when the weather gets warmer. The Cabelas Custom Glass rod arrived today. The case it came in was pretty neat. I quickly opened the case and assembled the rod. The quality of the rod looks very good. The wraps and finish is great. The rod has an interesting feel. The bottom half is firm and the top half is flimsy. I'm interested to see how this thing casts. I'm hoping to do a video review later in the week. The thing that puzzled me was where the sections connect together. The rods I'm an used to have a male and female end. The male end is usually totally concealed when the peices are fit together. With this rod there is no way to totally cover the male end. I'm not sure if that is by design or all glass rods are this way. My first impression of the rod is it is definitely worth the $99 price tag. Everything looks clean and well made. Cabela's might have a huge winner on their hands. 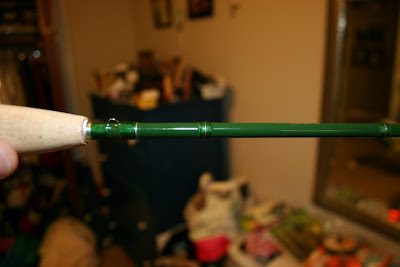 It's going to be fun to see how delicate this rod can cast. For my tests I'm going to throw 5 different flies. A dry, bugger, weighted fly, popper, and something in between a steamer and popper. It would be great to get a gill or bass on some of these casts to see how well the rod flexes under pressure. I got a chance to get out yesterday and fish the ponds by work. The bass were in the shallows. It looked like they were looking for spawning territory rather than getting warm. I caught a few on a fly I recently tied. The fly has olive green dubbing, rubber legs and a rabbit tail. I used dumbbell eyes to weight it down but I honestly think the fly would work even better with lead wraps under the dubbing. Either way the bass didn't seem to mind. There is a lake nearby that has some big fish in it. I think I will focus on this place next. A friend showed a pic of a 3lb bass he caught on a crank bait and he boasted about catching an 8lb plus before. Big fish could easily be in this lake but the water visibility is so poor I don't really see how big fish would feed. The fun will be finding out. I have been looking for a rod to fish small creeks for quite awhile. I wanted something short with the ability to cast in rhododendron choked streams. A week ago some friends had a get together and we were talking about various rods. Cabelas Custom Glass rods became a topic of discussion. The consensus was there is little known about them but from the specs and options they seem to be decent rods. The best part is the price. I looked them up on line the next day and I saw one of the rods is a 5'9 3wt. That rod might be flimsy but I like the length. I pulled the trigger and the rod is in the mail to me this week. I think it will be great for tiny wild trout streams. It should be perfect for the small warm water creeks and river that are local. Seems like a perfect bluegill rod. I'll do a full review once I have it. This video shows some fish tearing through bait fish near the shore. The camera angle is a birds eye view. It's pretty cool. Awesome Fish Attack ... Epic Heron Fail from Mark on Vimeo. I tried to make the best of the first weekend over 60 degrees by exploring new water. I have heard about New Hope Creek but never fished it. I have been hunting chain pickerel for awhile and from what I've heard New Hope is full of them. I spread the word of my plan and it wasn't long until I had a small band of fly fishers to share my adventure. I had no idea really where the water was or how to get there. I was given directions from a friend but I wasn't given a map or pointed to a particular spot. The directions were good enough and in no time my we were at the trail head. After about a half mile hike we got our first glimpse of the creek. There's something about seeing new water that gives you an adrenaline rush. The opportunities are endless and every knew experience is like a gift. My eagerness was subdued some by the steep trail we had to navigate to get down. There was some some rock hopping but we made it to the waters edge. The creek was clear and was the color of limestone. There was a newcomer with us and I offered him first cast. He passed and as I stepped into the creek I saw a shadow bolt into deeper water. At least I knew there was fish here. I cast my trusty white wooly bugger under a tree and I could have sworn I saw a swirl around my fly. I jerked the rod but nothing was at the other end. My next few casts yeilded no results either. We split up into groups of two. The thing you couldn't help but notice was how scenic the creek was. The feel of it was similar to the Eno River but set in a canyon with features like a mtn stream. The wading was fairly easy and there seemed to be structure set in perfect places for fish to hold. Even with all these great lies there was no sign of fish. The fisherhman I was with had a thermometer and I almost thought about packing up and leaving when he told me the reading. "Looks like it's 40degrees". I couldn't beleive it was that cold. No wonder there seemed to be no sign of life. I turned my attention into looking for deep holes where maybe all the fish were sitting. There was a nice one that had a family playing at the top of the pool. There were quite a few people near this creek as apposed to the Eno where you might see one person all day. We saw several families and people walking dogs. I'm not sure if there is always this much traffic, it could have been others getting out and enjoying the warm weather. Its been months since it has been this warm. The person I was with was new to fly fishing and he had asked me for some casting advice. I have a hard time instructing people on how to do things. I've learned mostly everything I know from just trial and error. Whenever I want to learn something I first just watch someone do it over and over. Then I try to copy it. Eventually I figure out a way between what they are doing and what works for me. My main advice for this person was practice. I tried showing him how to regain control of line using a double haul. But while I was showing him I thought to myself this is way too advanced. It took me about a year to do that properly. Eventually I just kept finding myself saying practice, practice, over and over. He was a really nice guy and took the advice at face value. I'm sure he and I will fish more. It's hard to fish with someone and not come away friends. That's part of the reason I enjoy fishing so much. It's also the times in between. Where you are walking from one spot to another just enjoying the little things. How the leaves are falling off a tree, analyzing a interesting looking fungus, watching bugs flutter around a rock or just admiring the shadows and how they lay across the trail. The only word I can use to describe it is entertaining. I'm constantly interested and amused by what I see while fishing. I'm hardly ever bored. There's always something around the next eddy that will keep the day going and make you want to stay for just one more cast. I have several youtube videos of me catching various fish. Stripers, Carp, trout, but none of them have had the interest as this one. A couple summers ago I filmed me fly fishing a small pond for bluegill. It was just kind of the perfect scenario. A warm summer afternoon, calm water, blue bird skies and ravenous gills. I managed to catch 3 fish on 3 consecutive casts which is no big deal really when bluegill fishing. I figured no one would even care when I posted it on youtube. After a month, I received a comment. Then a few more. Then I started to really monitor the traffic and in the videos 6 month after posting the views had sky rocketed to over 1500. It made me happy to see people just love bluegill fishing. It is really a type of fishing that gets you in touch with your childhood since these fish are usually the first to bend a rod. I checked today and there were over 3000 views and the traffic is still going steady. The love for the gill lives on and I think fly fishing for them is becoming more popular. I have been experimenting lately with thinner flies with skinny legs. I'm thinking these may work better for the small streams I fish. These were custom tied by a friend. They are made for going deep. The segmented look of the body is actually a steel wrap. Pretty cool. I wanted to try these out this weekend but the rain changed my plans. The weather lately has sucked. My buddy sent me this video today and I had to share. It reminded me of my childhood and the whole movie is put together well. I don't really get it but I decided to try fishing another pond even though the weather was in the 40's. This pond had no sign of life what so ever and the water was dark and clear. I decided to fish with the trusty white wooly bugger and on my 3rd cast fooled this guy. This fish is almost the exact same size as the one I caught yesterday. The coloring is a little better and the fish looked pretty healthy. It gave a decent fight too. I've never had this good of luck in early winter, hopefully it continues. I decided to try my luck at the pond near my work. The temperature was 42 degrees and I didn't expect much. When I walked up to the water I saw a carp cruising the bottom. I ended up hooking the bass in the pic above. It fought pretty hard but was lethargic when I released it. It was caught with a white wooly bugger. Finally got my first fish of the year!